Hong Kong—Platinum Guild International announces the publication of its Q3 Platinum Jewellery Business Review and PGI Insight, both of which detail that platinum has been improving its accessibility within the jewelry industry. The launch of branded collections, development of a female self-purchase trend, and collaboration of trade initiatives are fuelling platinum jewelry retail growth in 2018. “We are seeing that new segments are being further developed beyond bridal, and branded collections are generating higher margins for the trade by better meeting consumers’ needs. Competitive platinum prices, differentiated product offering and effective marketing are making platinum more accessible and more desirable,” says PGI’s global CEO Huw Daniel. In the United States, the third-largest platinum jewelry market, demand among trade partners is up 18% year-on-year for the third quarter of 2018. 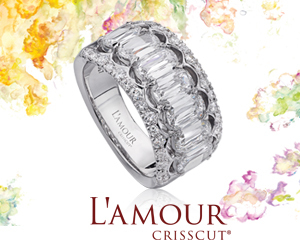 Weddings continue to drive U.S. platinum jewelry demand, and 24% of U.S. consumers prefer a platinum setting for a diamond ring. PGI’s platinum crown program is instrumental in driving demand up. 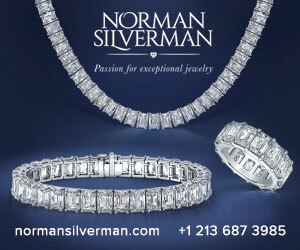 Once educated, most consumers are willing to choose platinum crowns for their diamond jewellery even at higher costs. Trade education and collaboration with strategic partners helped generate a 10% increase in platinum crown sales as of Q3 2018. New York, NY—‘Conservation’, the first video in the Diamond Empowerment Fund (D.E.F)’s new Real Stories, Real Diamonds, Real Impact campaign targeting Millennials, has garnered 11 million impressions in the first month alone. The one-minute video, which appears on both the Diamonds Do Good website and on YouTube, garnered 7 million views of at least :30 seconds, and 5 million views of the entire video. According to YouTube, “this is a a surprisingly high rate of completion, especially considering the longer length of the video.” The exemplary results of this first video is confirmation that D.E.F’s ‘Diamonds Do Good’ message is resonating with consumers. 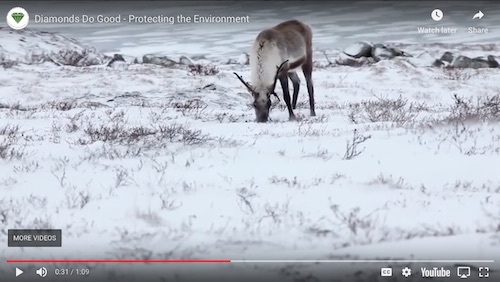 The ‘Conservation’ video is the first in a series the Diamond Empowerment Fund (D.E.F) will create to educate the public on the positive stories behind diamonds. All videos in the series will be housed on the D.E.F. website’s video library page. D.E.F’s Diamonds Do Good library of videos will be available for retailers to share with their customers. Click here or on the image below to watch. The Real Stories. Real Diamonds. Real Impact video library was made possible through the grant D.E.F received from the JCK Industry Fund, and media support was augmented through an in-kind donation by the Diamond Producers Association (DPA). In November, the Diamond Empowerment Fund launched the ‘Real Stories, Real Diamonds, Real Impact Proposal Contest’ with the winners being sent to Botswana in 2019, to see firsthand the positive impact of diamonds and share their experience through social media. 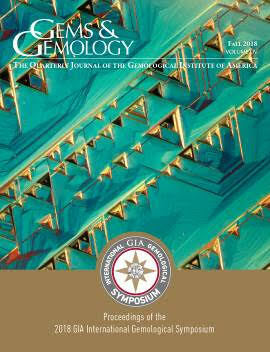 Carlsbad, CA—A recap and findings from GIA’s (Gemological Institute of America) sixth International Gemological Symposium are the focus of the Fall issue of Gems & Gemology (G&G), GIA’s quarterly professional journal. Nearly 800 attendees from 36 countries gathered in Carlsbad, CA from Oct. 7 to 9 for Symposium, to learn about leading-edge gemological and mineralogical research and advance understanding of global business. The research and business tracks ran simultaneously, offering guests the opportunity to immerse themselves in either area. The latest edition of G&G focuses on abstracts from the research track, including 37 speaker presentations and 68 poster sessions covering seven research themes: colored stones and pearls, diamond geology, diamond identification, gem characterization, gem localities and formation, general gemology and jewelry, and new technologies and techniques. In a parallel program, the business track offered classes taught by three Harvard Business School professors that explored real-life case studies on Authentic Leadership, Customer Centricity and Disruptive Innovation. The G&G issue closes with a recap of Futurescape Forum, which offered unique insights into the trajectory of the gem and jewelry industry. The panel featured Bruce Cleaver, CEO of the De Beers Group; Gina Drosos, CEO of Signet Jewelers; Jason Goldberger, CEO of Blue Nile; Andy Johnson, CEO of Diamond Cellar Holdings; Rahul Kadakia, international head of jewelry at Christie’s; and Kent Wong, managing director of Chow Tai Fook. These industry leaders discussed technological breakthroughs, changing consumer tastes and sustainability concerns. This issue also includes a montage of photos from all three days of the event. Each Symposium guest will receive a complimentary print copy of the Fall 2018 G&G. This and every issue of G&G since 1934, including full articles, lab notes, photo galleries and exclusive video footage, are available at no cost on GIA’s website at https://www.gia.edu/gems-gemology. Additional research articles are available at http://www.gia.edu/gia-news-research. Print subscriptions and copies of back issues are available at http://store.gia.edu.